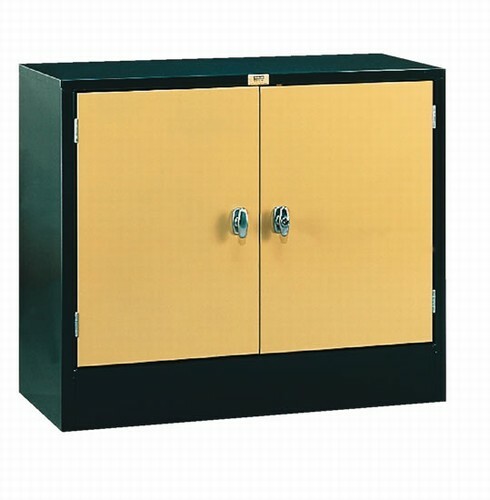 Designed to keep clay projects moist and workable, Debcor's Damp-Proof Cabinet is constructed of 19-gauge welded steel with 16-gauge supports. Foam rubber gasketed doors seal the air and keep the moisture in. Exterior walls are "double-walled" with an internal layer of anodized sheet aluminum. The 4 heavy-duty, bolt-on shelves have aluminum surfaces and water retaining bats (2 shelves on the smaller unit). The unit is dark brown with antique gold doors. Doors have a 3-point locking mechanism with 2 keys. Shipping weight for large cabinet is 275 lbs. Cabinet ships from manufacturer. NOTE: Truck shipment is required. The additional charge for a truck shipment varies, depending on distance, weight, and bulk. Our shipping department chooses the best carrier based on their own set rates, service level, and availability. This is a non-stock special order item.